Ek Villain should have shocked you. Instead, its unintended comedy makes you laugh. Here, sample this: A psycho tries to kill a nurse because she nags, but gets a timely lifeline when his nemesis, a revenge-seeking goon, beats him to pulp. “How can he die?” retorts the goon. “I need him alive to torment him.” And he starts pounding on the psycho’s chest. “But he is dead,” the nurse screams again. “Come on, bring him back to life,” the man. Cut to the goon doing exactly that and the psycho spluttering back to life. Director Mohit Suri might come up with some medical explanation for that. How about this then? Our said psycho gets very agitated when any woman talks back to him. Bees buzz in his head, which is relayed to us through Dolby stereos. The next thing you know, he is sticking screwdrivers into the poor woman’s body. He won’t just leave the girl to die. He will tell the poor girl, gasping for breath, his life story. If all that sounds menacing, picture this: Our man has struck down a woman. You wait for the screwdriver to come out. He opens his bag and lo, he takes out – no, not the screwdriver, but a hoodie. Apparently, he must do this fancy dress, look menacingly into the camera, mouth the ‘punchline’ – ‘woman, you will never ever have to complain’- before he can get to business. These two episodes are not taken out of context to deride the movie. Ek Villain, seriously, is regressive. It is clichéd to the hilt. Come on, Mr. Suri, a protagonist with terminal disease? Really, wasn’t Anand made in 1971? We still need such emotional hoodwinks? 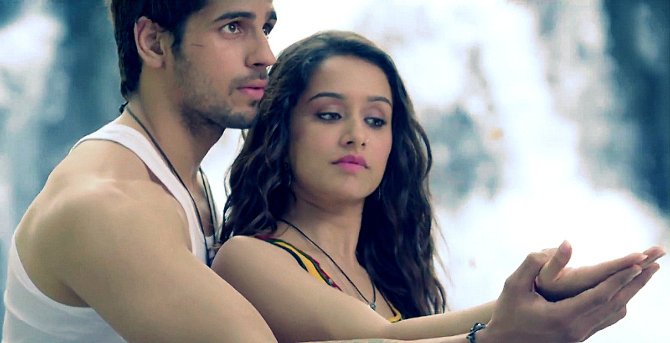 So what does Ek Villain all about? We have Villain 1, the daredevil contract killer Guru (Sidharth Malhotra) who is now reformed after a chance meeting with the world’s greatest do-gooder Aisha (Sraddha Kapoor). Villain 2, Rakesh (Riteish Deshmukh) is a typical aam aadmi with a nagging wife. Villain 3 is Ceasar (musician Remo Fernandes), the boss of Guru. Villain 4 is a police officer who is playing games that no one really understands. The film shuttles among all these characters without accomplishing anything worthwhile. What should have been an intense face-off between Guru and Rakesh becomes a pathetic show of empty action and loud acting. After a fascinating start, Sidharth Malhotra soon runs out of his depth in Ek Villain, and it is not because of want of trying. Sradha Kapoor is so sprightly we might want her just to keep quiet. Following the terrible Humshakals, Riteish found a blessing in Ek Villain. Here is a film in which he doesn’t have to act. He is as wooden as he can get, and if you think that putting on contact lens and staring emptily makes you look creepy, sure bro, whatever. Films need not be informative, inspirational or motivating. But it must have at least one strong plot point that makes you trust in its narrative. In Ek Villain, that plot point is ‘nagging.’ If only that could get anyone anywhere!